From Bloomfield Village to Benzie County, Chris and Kim Pickell (pronounced pick-ELL) and their children have trekked I-75 and M-10 for nearly a decade to Crystal Mountain, one of Michigan’s most scenic golf and ski resorts, located 28 miles southwest of Traverse City. Initially, on a whim, the Pickells purchased a quaint second home in the resort area that met their needs when the children were small. Over the years, Crystal Mountain’s world-class golf and snow sports instruction helped groom the children into becoming competitive golfers and avid skiers – sports the entire family enjoys. Four years ago, their current one-acre site was purchased with the intent to build a retirement home after the children graduated from college. Instead, it made more sense for the Pickells to build before the college send-offs in order to have everyone’s input in the design and functionality of the home. To build their dream retirement home, the Pickells turned to David Puccio, president of Portland Building Company in Honor. Impressed with his work in building a garage for their previous Crystal Mountain home, the Pickells had no reservations in hiring Puccio and his team for the long-distance project. “We felt so strongly about him,” explains Kim. “He is a solid, solid guy, has a very good reputation, has downstate connections, and did a phenomenal job on the garage,” adds Chris. “Being downstate, it’s nice to have someone you completely trust building your home.” Puccio notes that while long-distance building can have its challenges in keeping both the builder and customer on the same page, constant communication and photos are key, especially when modifications are needed. Puccio and his team adeptly accommodated several onsite changes. Kim recalls the architect’s suggestion for a bathtub in the master bath. “Chris and I are not bathtub people,” she notes. “On the spot, David reconfigured the linen closet and shower to eliminate the tub.” Chris recalls one of the rough framers suggesting that a wall be opened up in an area of the lower level. The advice was greatly appreciated, and the change was made. Neighbors helped, too. One shared how he wished he had a lower garage for the golf cart. The Pickells took note, and Puccio’s team added it. 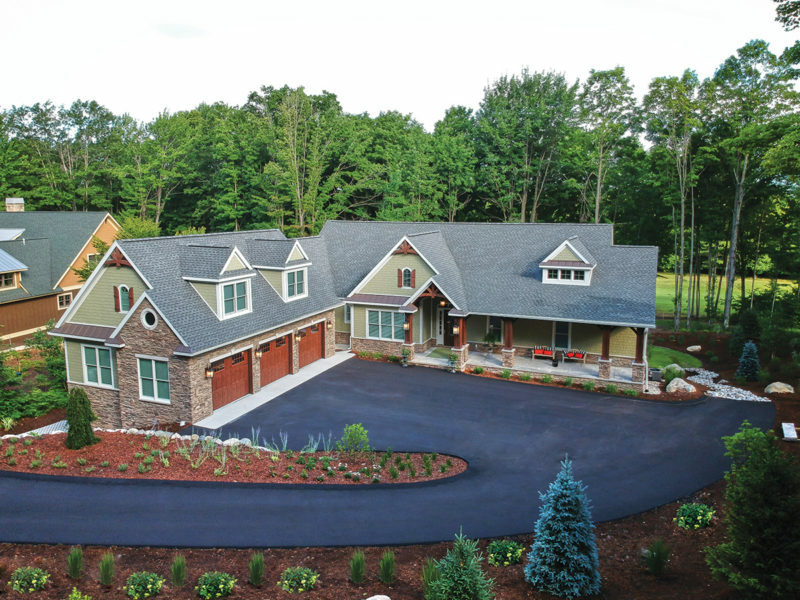 When heavy rains caused water to pool in front of the garage and home, Puccio installed a storm drain system to guide the water away from the home, noting what a lucky break it was to experience that in the building process rather than two years down the road. “We always felt like we had a team with our best interest in mind,” says Kim. The exterior of the home displays elements of the Craftsman style with decorative, custom-built cedar arches and gable ends, James Hardie siding, and cultured stone. The interiors of both the main and lower levels are vast, light-filled areas designed for ultimate relaxation, entertaining, and enjoying the views from just 20 feet above the golf course. Flooring throughout both levels (including the five-foot-wide staircase and three of the four bedrooms) is engineered European white oak. With a little oil, blemishes disappear into the character of the grain, keeping the family’s rambunctious golden retriever out of the doghouse for any nail scratches. In the kitchen, Shaker-style white cabinetry, quartzite countertops, a pantry, and the large open area are specifically designed to accommodate both cooking and entertaining with oversized walkways to ease movement. A custom-built range hood in copper hues adds an artistic touch to the clean lines of the kitchen. Custom built-in bookcases with adjustable shelves on each level, three gas fireplaces in varying sizes using chardonnay-hued drystack ledgestone, and a neutral color scheme throughout the home help create the quiet and cohesive look the Pickells desire. “Literally, it’s the only place where our kids shut off their phones and drop them on the counter,” says Kim. At every turn, Andersen windows allow stunning views of the woods and golf course, and the large screened porch with floor-to-ceiling fireplace stonework truly allows a bird’s-eye view of the natural surroundings. Sliding aluminum-framed windows not only protect the screens from harsh winter winds, but also allow the Pickells to leave the outdoor furnishings in place year-round.